Opposition politicians in Guatemala want the head of the emergency response agency (Conred) to be dismissed. They say Conred failed to heed advance warnings about Sunday's deadly eruption of the Fuego volcano. A senior opposition figure, Mario Taracena, said the government should investigate whether there was criminal negligence. Ninety-nine people are now known to have died since Sunday, and nearly 200 others remain unaccounted for. Villages on the slopes were buried in volcanic ash and mud after Fuego erupted. Subsequent smaller eruptions and the high temperatures of the rock and mud debris have made search teams' work extremely difficult. More than 1.7 million people have been affected, with more than 3,000 evacuated. What is the emergency agency accused of? The argument revolves around a crucial question: was the order to evacuate given clearly and with sufficient warning before Volcan de Fuego erupted on Sunday? The national institute for seismology and volcanology says that its conscience is clear, that it issued the relevant warning in plenty of time. It claims the responsibility for any failings lies with the civil emergency authority, Conred, which didn't then act on its warnings. It has been shown that Conred's Twitter feed as late as 11:00 on the morning of the eruption said that it wasn't yet necessary to evacuate. The organisation has denied it was to blame and that when it did issue the alerts, they were ignored. What about the search operation? Of the 99 bodies recovered so far, only 25 have been identified. "We already have data with names and locations where there are missing persons and that number is 192," said Sergio Cabañas, the Conred head. 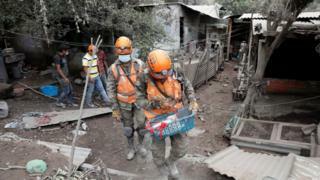 Searches are continuing, but there are fears that heavy rain could cause fresh landslides of volcanic mud. Meanwhile the volcano is continuing to spew out ash and rocks. 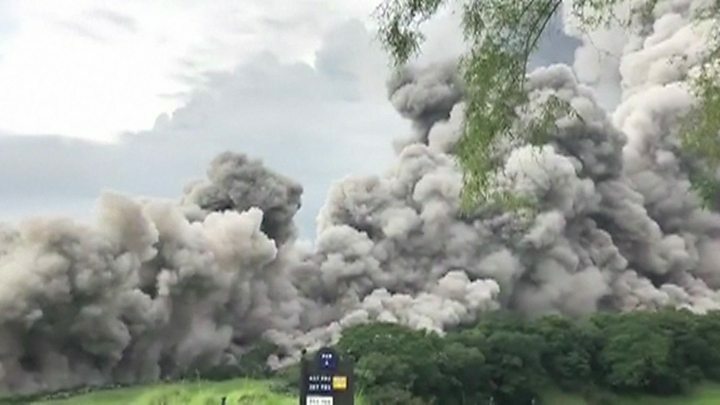 "The activity continues and the possibility of new pyroclastic flows in the next hours or days cannot be ruled out, so it is recommended not to remain near the affected area," the national institute for seismology and volcanology said. How are the survivors faring? There are 3,000 people being accommodated in temporary shelters out of the 12,000 who were evacuated from the area. Volunteers have been handing out food and other essentials to those affected, as well as to rescue workers. Mr Cabañas said that local residents had received training in emergency procedures but were not able to implement them because the initial volcanic activity happened too fast. A pyroclastic flow is a fast-moving mixture of gas and volcanic material, such as pumice and ash. Such flows are a common outcome of explosive volcanic eruptions, like the Fuego event, and are extremely dangerous to populations living downrange. Just why they are so threatening can be seen from some of the eyewitness videos on YouTube of the Guatemalan eruption. In one, people stand on a bridge filming the ominous mass of gas and volcanic debris as it expands from Fuego. Some bystanders only realise how fast it is travelling as the flow is almost upon them. The speed it travels depends on several factors, such as the output rate of the volcano and the gradient of its slope. But they have been known to reach speeds of up to 700km/h - close to the cruising speed of a long-distance commercial passenger aircraft. In addition, the gas and rock within a flow are heated to extreme temperatures, ranging between 200C and 700C. If you're directly in its path, there is little chance of escape. The eruption of Vesuvius, in Italy, in 79 AD produced a powerful pyroclastic flow, burying the Roman towns of Pompeii and Herculaneum under a thick blanket of ash.